We had an excellent tour of Zimbabwe which didn’t start that well with a defeat against Australia in our second game of the Tri-Series tournament, but the remarkable manner in which the team made a comeback by winning all their remaining matches by putting in some excellent performances was absolutely brilliant. They were outstanding in their batting, bowling as well as in their fielding especially against a top team such as Australia. It was great to see that the skill levels of this team in all aspects of the game were right up there with the very best and I am convinced that with the blessings of the Almighty, we are heading in the right direction. The manner in which Fakhar Zaman has become the quickest batsmen in history to reach 1000 runs in ODIs in only 18 innings speaks volumes about his talent and skills. He is a batsman who wants to learn every day and his work ethic, whether it is to improve or practice his batting or fielding is simply brilliant which is something you need to succeed at the top-level. This is exactly why we also picked him recently in the Test squad. On top of that, he is a brave player and if you want proof of that, you simply need to look at the number of times he has been hit on his body and how it’s not affected his drive to take on fresh challenges. To have a player of his calibre in the national side is a great sign for the future of Pakistan cricket. Faheem Ashraf is another name which readily comes to mind when we speak of players who are eager to learn and improve themselves with each passing day. There is a real hunger in Faheem to become a better player as he is always looking to fine-tune his abilities. This is exactly why we were very happy to use him in all 3 Tests that we played this summer in Ireland and England. That is also why he was asked him to bowl with the new ball against the likes of the very aggressive Aaron Finch who we wanted to deprive of room at the start of the innings when we recently played Australia in the T20I Tri-Series in Zimbabwe. He continued to impress us all with his desire to improve himself when he bowled superbly in the 3rd ODI against Zimbabwe, picking up 5/22. I think it would be fair to say that Faheem Ashraf and Shadab Khan have both improved tremendously during the last year. In fact, it would not be wrong to say that the best things about the current group of Pakistan's younger players is that they play for the team and not for themselves and that they just want to keep on learning and improving. To me, this is exactly what we need from our youngsters. Usman Khan Shinwari’s eagerness for working hard is the typical attitude you find in all our younger players who want to improve and are all level-headed guys. One thing I always emphasise to all our players is that yes, it's fine to celebrate your good performances but then you need to forget about this for the next day so that you go out and repeat and better what you did the day before. What I instil in the players is that there is no need to look at what others are doing, but to look within yourself and to remember to compete with yourself. For example, if you have a 5-fer one day, then you must look to beat your own achievement in the next game with say a 6-fer to your name. With The Almighty’s blessings, using this philosophy, all our youngsters in the team are improving day-by-day. Players such as Usman Khan Shinwari and to be fair, all our youngsters such as Faheem Ashraf, and Shaheen Shah Afridi who has a lot of potential, provided we manage his workload and fitness in the future, continue to impress everyone with their work-ethic and talent which to me as their coach is very pleasing and satisfying. As we know, Mohammad Amir had some fitness issues during the tour of Ireland and England, but he improved after being treated by our physiotherapist. With that help, he was able to play all 3 Tests but the fact is that in his case, there is still hard work to be done to improve his fitness. We have to remember that he has come back into international cricket after an absence of 5 years and we are all working hard to improve his fitness. 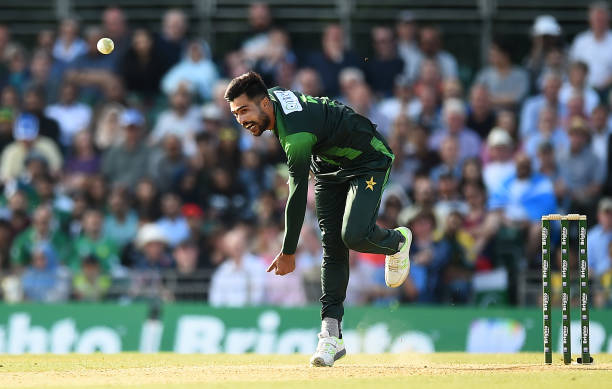 There is no doubt about the quality of skills that Mohammad Amir possesses and whilst he is very good with the older ball, what he really needs to do is to strike a bit more for us with the new ball. He may have been a little unlucky with dropped catches off his bowling, but we do need him to be more effective at the top of the innings. If he can strike consistently with the new ball, then it eases the pressure on the other bowlers and allows them to perform well. Needless to say, Mohammad Amir is working hard to improve his performances. Currently, there is a slight issue with his wrist position which we are looking to fix and hopefully, with this month-long break before our next assignment, he will come back as a different and more effective bowler. No one can question Mohammad Hafeez’s abilities as a cricketer which have seen him put up some excellent performances for Pakistan in the past decade. However, the management felt that we need to move forward with the younger players and are treating Mohammad Hafeez as a back-up opening batsmen behind Imam-ul-Haq who has performed exceptionally well to have scored 4 hundreds in 9 ODI innings. Now, we cannot drop a player who has played so well and give his slot to Mohammad Hafeez simply as a way of giving a game to the experienced player and also, the management want to see where we stand as a team as we progress towards the 2019 World Cup. There was no other reason for Mohammad Hafeez’s exclusion from the ODI side on the Zimbabwe tour. Having played in that role, I know that an all-rounder is always a handy option for a side in any format of the game as that gives a balance to the combination. This is especially true in Test matches. So, Pakistan use Faheem Ashraf as our all-round option who fills the slot of the 5th bowler and is also useful with the bat, very much the role that Shadab Khan also plays for us. For India, Hardik Pandya has the potential to be a good all-rounder but as he must have realised by now, it’s not easy to fulfil that role in Tests compared to the shorter formats of the game. Test match cricket is a hard format to play in, but age is on Hardik Pandya’s side and he definitely has the potential to be a good player for India in the future in all formats. In my view, no discussion of the ongoing Test series between England and India can be complete without a mention of Virat Kohli’s excellent batting performance in the 1st Test of the series. To me, Virat Kohli is a champion player and one of the best batsmen in the world and I was a little dismayed at the reaction of some on social media who instead of praising Virat Kohli’s special innings of 149 harped on about his catch being dropped by Dawid Malan when he was on 21! India’s problem is that like England, their batsmen are suspect against the moving ball. Of course, it is easy now to say that the rest of the Indian batting is weak but if the conditions are good for batting then the Indian batting has enough potential to ensure that this will not be a one-sided series. I do feel that once the conditions are right, this will be a tough series which is what the followers of the game want. Watching Tests in England is something special for the audiences and I hope that Virat Kohli who is a fighter will have a chat with his team, gather them and that India will come back harder and stronger in the remaining matches. Looking back at the first Test, there were mixed fortunes for both teams and no one really knew how the match would end. One does wonder what the outcome would have been had Virat Kohli stuck around in the second innings. To me, if there is one thing that the first Test has shown to all is that this will not be an easy series to win for any side and it does promise to be a closely contested series. I have great admiration for Sam Curran who I feel has great potential. When he started his stint at Surrey, I played alongside him in a second XI game and I can tell you that he is a player who is always eager to learn. His talent was visible to all when he debuted for England against Pakistan and in the way he played against India at Edgbaston to become the youngest player to get a Man of the Match award for England in Tests. As I explained to Alec Stewart when he asked for my opinion about Sam Curran, I feel that to succeed in international cricket, he needs a to work a bit more on his pace. He bowled around the 85 mph mark in the recent game but if he can up that speed then it will help him immensely in his future games for England. I am sure he is working hard on this aspect of his game and the more cricket he plays at the top-level, his pace will improve. He is only 20 years old at the moment and whilst his current bowling speed is good for bowling in England, he will need to improve that to be a threat to the opposition when he plays away from home in places like Australia.